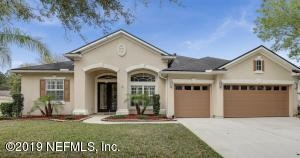 Bartram Springs Beauty with lots of new! 5 Beds 4 Baths 3,171 Sq. ft.
A Bartram Springs beauty with lots of updates such as granite counters and island, wood floors, tile floors, Nu Flame vent less fireplace in family room with beautiful stone access wall! You will love the 3-way split floor plan with a rear bonus media room. The screened lanai is accessed from owner's suite and kitchen nook. The tropical back yard is fenced. Bartram Springs has the Top rated Bartram Springs Elementary school and the community feaotes and a splash park, gym, soccer field, basketball, volleyball, pools, slide playgrounds, dog park and tennis court. Tax bill includes CDD fee. HOA is $74 per year. Room dimensions are approximate: Living room: 15 x 10, Dining room: 15 x 10, _16 x 10, Kitchen: 14 x 14, Breakfast Room: 9 x 7, Family room: 19 x 16, Master bedroom: 18 x 13, Second bedroom: 12 x 10, Third bedroom: 11 x 10, Fourth bedroom: 12 x 11, Rear Bonus/Media: 29 X 14. Tile entry, formal living and dining rooms and bathrooms, wood floors in office, family room, kitchen and nook. Carpeting in all bedrooms and bonus/media room. Large screened lanai and beautifully landscaped yard to enjoy with the travertine patio & Pergola! The 3 car garage features key-less entry pad, utility sink and pull down stairs for attic access. Lots of quality features that include wood floors, granite counters in kitchen with center island, bosch stainless steel dishwasher, 42" raised maple panel cabinetry and walk in pantry. Tile floors in entry, baths and formal living and dining area. You'll love the Nu Flame vent less fireplace (Ethanol fuel) and stone accent wall in the family room with surround system (smart TV can stay with home). Lots of extras that include window shutters, custom moldings, niches, upgraded lighting, water softener, a new Nest thermostat, central vacuum, custom closet organizers in owner' suite, ceiling fans, and a top of the line gas cook top and oven installed in 2016.